Woyko was presented to Wilhelmina on 26 March 1892 after a training of 4½ months in the Royal Mews, The Hague, The Netherlands. Queen Wilhelmina then was 11½ year old. Woyko measured only 130 cm and was 8 years old. Twice Otto Eerelman has painted the Queen riding Woyko, but this horse portrait was made for Eerelman’s album of 41 horse breeds. That album with lithographs was published in the Netherlands around 1900, a German edition was published in 1903-1905 and a French one in 1905-1907 in Belgium. In the German and the French edition Woyko was left out, probably because this horse did not represent a real breed. According to the register of the Royal Mews, Woyko was bought from the horse trader Woltmann in Berlin and considered to be Arabian from unknown descent. 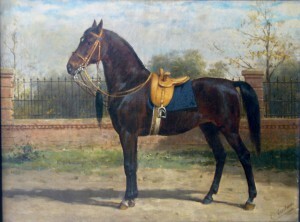 None of the original paintings of horse breeds by Otto Eerelman has survived, except this portrait of Woyko, that was not transported to Germany and Belgium. Now this unique horse portrait is on view in the beautiful exhibition ‘Otto Eerelman, schilder van aanzien’ (‘Otto Eerelman, a painter of high standing’) in Rijtuigmuseum Nienoord in Leek, The Netherlands, 25 April – 2 August 2015. Next to a painter of horses Eerelman was an expert in painting dogs and dog breeds, of which this exhibition also shows the finest examples from private collections.